sensitivity to the local people and environment. KY International's spa designs range in size from 12,000 to 33,000 square feet and vary in complexity by combining such amenities as luxury villa and suite accommodations, as well as commercial and retail components. Such unique design elements as outdoor spa gardens have elevated the definition of a luxury spa facility and surpassed KY International's client expectations. This spa was designed to capture the healing powers of the tropical garden. Treatment pavilions intermingle with float pools, labyrinths and lush greenery to provide a spiritual refuge from the hectic pace of the city. In a welcome departure from the tropical-themed spa retreats, the Spa Botanica at Tanglin Club boasts modern design and clean expanses without sacrificing the warm, cozy ambiance associated with spa treatment. The spa design expands upon an existing hotel with the addition of a full-service, comprehensive health and wellness spa, a 32-room spa suite wing and 72 serviced apartments. A series of outdoor gardens and lagoons located throughout the complex formed the basis for the design and establishes a sense of tranquility and peace central to the success of the spa. Elegant and simple, this elite spa and state of the art work out facility spans the 6th and 7th floor of the Westin Guangzhou Hotel. The spa design and architecture move drastically away from the traditional spa vocabulary, and transport the guest from the hyper kinetic city to a place of reflection, relaxtion and resoration. Artfully designed using sustainable and green building practices, the spa is offers physical, emotional and spiritual comforts. The harmonious proportions, forms and shapes create beauty and tranquility, transporting our guests to a higher level of spa experience. 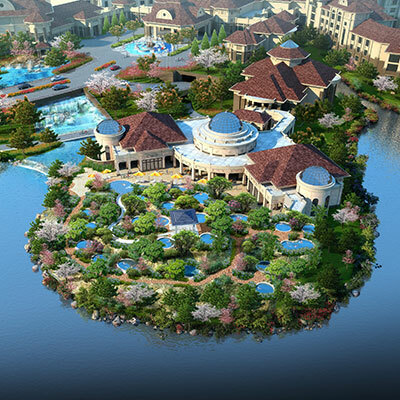 Conceived literally as a natural onsen on a world-class scale, onsenworld is designed as a self-contained landscape environment employing indoor onsen facilities as well as outdoor hot springs and grotto pools. In addition to the the expansive pool deck and reflecting pool, the Oceania Point Regal Palace Hotel features a sprawling river pool on the Northern perimeter of the property making use of the gentle sloping terrain by employing integrated waterfalls and terraced hot spring pools.